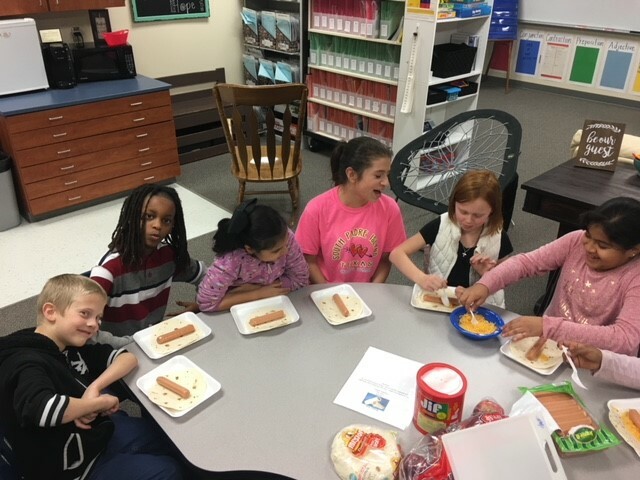 Students at Sigler Elementary in Plano participate in an afterschool cooking club called Sigler Chefs. 2nd through 4th graders are chosen by their teachers to participate in this 4-week club that takes place every Friday afternoon during the spring semester. We begin each class talking about the importance of eating healthy afterschool snacks as well as what ingredients make a healthy snack healthy. After our discussion we cook/make snacks that fall under the “healthy” snack guidelines we have discussed. As a Title 1 campus, it is important for me to choose ingredients for our snacks that all our students would find in the cabinets of their homes. My hope is they will continue to make these snacks even after cooking club is over. Each week students are able to cook/make 2 snacks. They do all the cooking. They learn to measure, cut (with plastic knives), mix and use the microwave. We usually make one snack that could be eaten at breakfast or lunch and one snack that falls more into the “snack” category. Some of the snacks we have made during class time include: donkey tails (hot dog rolled up in a tortilla with fat free shredded cheddar cheese then warmed), apples with apple fluff dip (sliced green or red apples with yogurt/peanut butter mix), banana bites (sliced bananas dipped in yogurt and then rolled in oats/cereal), bean and cheese quesadillas (tortilla, vegetarian beans and fat free shredded cheddar then warmed) and pizza (tortilla, fat free shredded cheddar cheese, pizza sauce then warmed). The students all love coming to cooking class and can’t wait to see what we will be making each day.